I am so excited to announce the 2019 Follow Along with Phyllis – new quilt! This year it is called “My Little Forest” (47” x 53”). We will start on the first Saturday in January and you can join for just $10 and follow along each first Saturday of the month by coming into Wooden Spools or from a distance through email. For more details check out the web site or come in to the store to sign up. I hope you join me and create your own Little Forest. If you stop by Wooden Spools, I should have my original quilt finished and hanging in about a week or so (it still needs a little more quilting and then binding, label and sleeve). 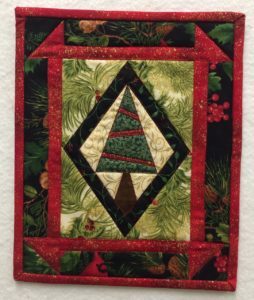 I guess I must have a thing about trees this month because I want to share several little tree quilts I have pulled out of my stash as I began to decorate for Christmas. I made the first one in 2011 and when I made mine, I think I also made 6-7 others for my mom, my sister, my daughter and friends. It is only 8.5” x 10.5” so it went together quickly. I don’t remember where I got the pattern but isn’t it precious? It is paper pieced and simple which made it easy to create so many in a short time. I may have shared this next one with you last year but if I did, I hope you can enjoy it again. 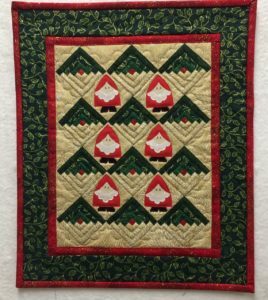 The little Log Cabin blocks that make the trees (green top, red center and cream-colored bottom) are only 2” x 2” but I think you know me by now and you know I like blocks that are smaller and smaller. These blocks have 13 “logs” in each 2” block and the quilt measures 13” x 15.75”. I like the little Santas that seem to be hiding in the little Tree Forest. 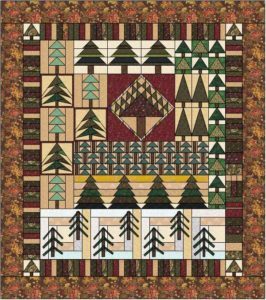 This last Tree quilt was made by a friend named Diane in a quilting group I belonged to in the 1990s. Unfortunately, she didn’t label it so I’m not sure what year it was. That is a good reminder to me to put a label or at least write my name and the year on the back of every quilt I create, large or small. 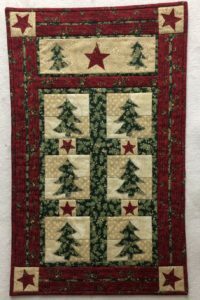 This quilt measures 15” x 24” and has appliqued trees and stars. It seems to be timeless and I love it even years later. ← Small Business Saturday – HUGE SALE!